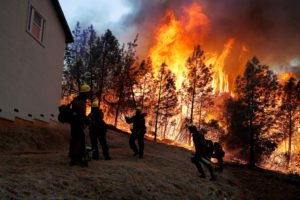 PORTLAND, Ore. — Just two months after a wildfire wiped out Paradise, California, officials are gearing up for this year’s fire season and fear the government shutdown could make it even more difficult than one of the worst in history. The four-week-long shutdown is having a ripple effect — from firefighters on the ground to managers who control the firefighting strategy. Smokejumpers parachute into remote forests to battle blazes not accessible by firefighters on the ground and hotshot crews are small groups of elite firefighters trained to battle the most ferocious flames. The winter months are critical for wildfire managers who use the break from the flames to prepare for the next onslaught.